While the cause of a radiation leak at the United States’ first nuclear waste repository remains unknown, officials have reportedly pinpointed the facility’s contaminated area. According to the Associated Press, the Department of Energy’s Tammy Reynolds told residents in Carlsbad, New Mexico, that no definitive conclusions can be made regarding the latest discovery, but that further investigation into the area should produce some information next week. The Waste Isolation Pilot Plant (WIPP) has been shut down since February 14, when increased radiation levels were detected inside and outside the plant. On Wednesday, crews investigating the leak made their way into the WIPP and inspected the facility’s various panels, or the large underground salt beds where nuclear waste is stored. These panels are located about a half-mile below the Earth’s surface, and after five hours of inspection they found that Panel 7 was the source of the leaked contamination. Despite the discovery, however, workers had to leave the plant due to radiation readings that spiked as they neared the panel in question. As reported by the Reuters, the next phase of the investigation will be to explore Panel 7 and see if workers can determine what exactly caused the leak. With high levels of radiation detected, however, that will be difficult for humans to do – so much so that federal officials will use robots to inspect the area if extra protective gear proves to be insufficient. The AP is reporting a roof collapse as a potential cause, but officials are also considering the possibility that a forklift punctured one or more of the waste containers. Although the WIPP has been shut down for about two months now, elevated radiation readings have been recorded at least twice in the plant’s surrounding area. Air monitors have picked up trace levels of radiation, but federal officials have emphasized that they are well below what the Environmental Protection Agency considers a public health danger. About 21 workers have also tested positive for radiation, though it’s unclear to what extent they have been contaminated. As RT reported previously, the facility’s shutdown had stalled the shipment of other nuclear waste. Last month, government officials decided to transfer one such shipment to Texas until the plant is deemed safe enough to reopen. 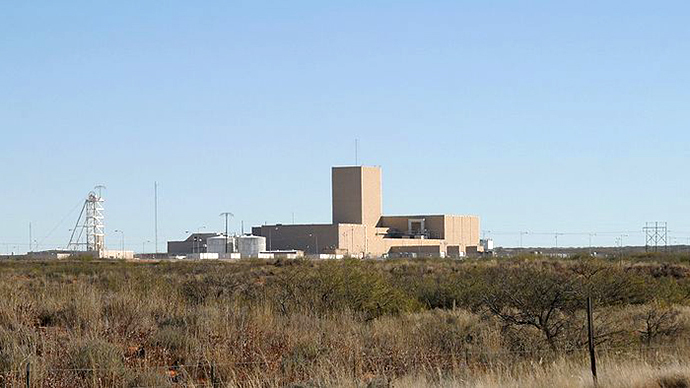 This radiation leak is the first known instance the WIPP has experienced since it was constructed in 1999, but some watchdog groups, such as the Southwest Research and Information Center, have labeled the project a failure due to the recent leak. Plant operators, meanwhile, claim the WIPP’s safety measures have worked as planned.